The following is a list of the American primal cuts. 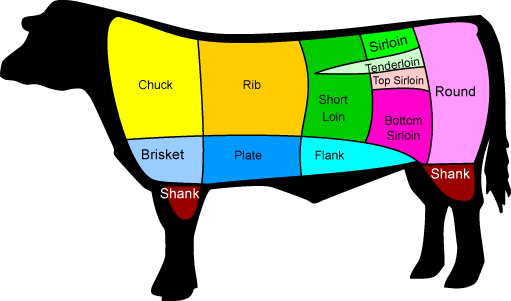 Beef are split along the axis of symmetry into "halves", then across into front and back "quarters" (forequarters and hindquarters). The chuck is the source of bone-in chuck steaks and roasts (arm or blade), and boneless clod steaks and roasts, most commonly. The trimmings and some whole boneless chucks are ground for hamburgers. The rib contains part of the short ribs, the prime rib and rib eye steaks. In Asia, brisket is used primarily for stews (e.g., five-spice beef, curry beef brisket;) while Westerners tend to use it for barbecue, corned beef or pastrami. The foreshank or shank is used primarily for stews and soups; it is not usually served any other way due to it being the toughest of the cuts. The flank is used mostly for grinding, except for the long and flat flank steak, best known for use in London broil, and the inside skirt steak, also used for fajitas. The loin has two subprimals, or three if boneless: 1. the short loin, from which the T-bone and Porterhouse steaks are cut if bone-in, or strip steak (Kansas City strip) is cut if boneless. 3. the tenderloin, which is the most tender can be removed as a separate subprimal, and cut into filet mignons, tournedos or tenderloin steaks, and roasts (such as for beef Wellington). They can also be cut bone-in to make parts of the T-bone and Porterhouse loin steaks. The round contains lean, moderately tough, lower fat (less marbling) cuts, which require moist cooking or lesser degrees of doneness. Some representative cuts are round steak, eye of round, top round and bottom round steaks and roasts.